Get website downtime alerts by SMS, phone call or email if your website is down. Uptime.com checks your website availability at one minute intervals from 30 different locations across 6 continents. Uptime and server response time reports. Get daily, weekly, or monthly email reports and check website uptime history. Unlimited capability to monitor HTTP(s), Transaction, Real User Monitoring, API, Ping, SSH, TCP, DNS, Email and more. Receive alerts via email, SMS, Twitter, web-hooks, or push notifications. Develop an app from our list of projects, or build a custom app. Real-time, actionable server performance, website performance, and domain health insights for your team. With one click, monitor domain health and identify critical issues: Web, DNS, Email, Blacklist and more. Optimize the experience of actual users on your website leveraging detailed analytics, trends and page load time analysis. View detailed summaries & graphs over any time period, and create private dashboards, public status pages and SLA reports. Push our data straight into your workflow utilizing our many integrations & push notifications. 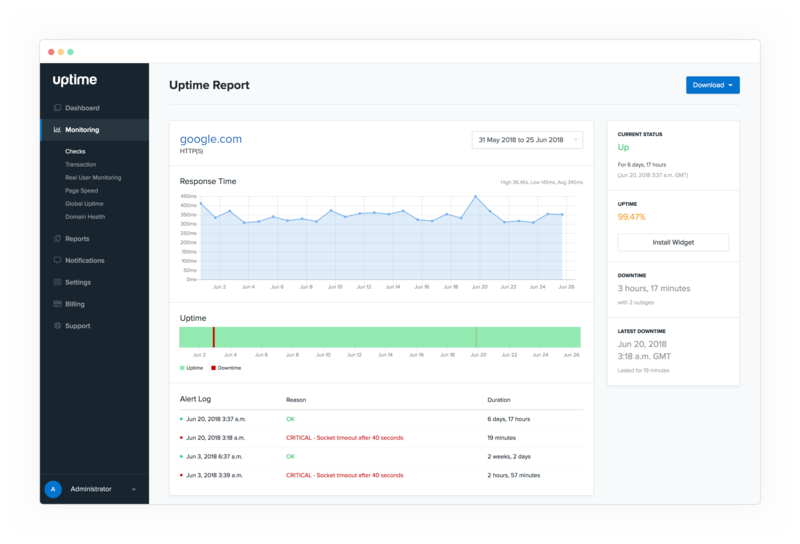 Thousands of companies trust Uptime.com to monitor their web infrastructure.